On the left, the pendulums do not oscillate in synchronization; on the right, they have organized themselves to a synchronized oscillation. With quantum systems, such a classical synchronization can be the “smoking gun” for entanglement. This prediction of the German-Italian collaboration working with Marc Timme and Dirk Witthaut can be checked in the laboratory. 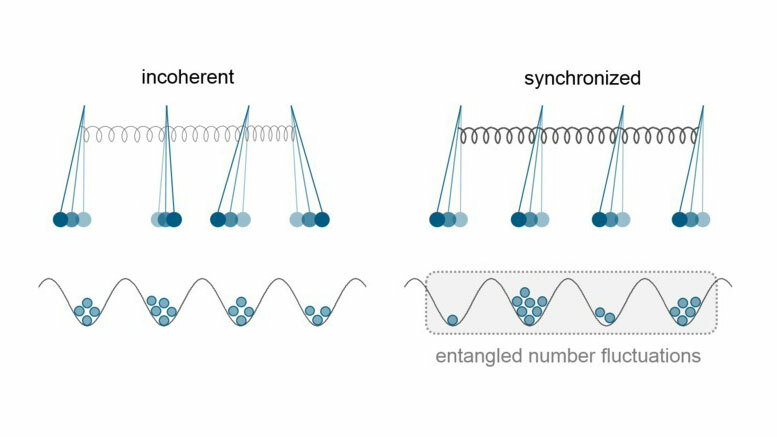 A newly published study from the Max Planck Institute shows that quantum systems can synchronize through self-organization, without any external control. As if by magic, seemingly independent pendulum clocks can come together to tick simultaneously and in synchrony. The phenomenon of “self-organized synchronization” frequently occurs in nature and engineering and is one of the key research fields of Marc Timme’s team at the Max Planck Institute for Dynamics and Self-Organization. The physicists in Göttingen are part of a German-Italian collaboration which has now published an amazing discovery in “Nature Communications”: even quantum systems can synchronize through self-organization, without any external control. This synchronization manifests itself in the strangest property of the quantum world – entanglement. In 1665, the Dutch researcher Christiaan Huygens (1629-1695) was working on a novel clock for ships. At the time, pendulum clocks were the state of the art, and a specially shaped pendulum was intended to respond less sensitively to the rocking of the ships. Ship’s clocks working as precisely as possible were the key to exact determining longitude. For protection, Huygens had built two of his pendulum clocks into a heavy housing, which was suspended such that it should largely compensate the rocking of the ship. He then discovered a surprising phenomenon: Although the clocks ran independently of each other and were not subject to any external influence, their pendulums swung in precise synchrony within at most half an hour after each restart. Huygens surmised even back then that the two pendulums synchronized via tiny “imperceptible motions” in the joint suspension of the two clocks. His guess was correct, as physicists were later able to demonstrate for such oscillating systems. “One can observe such clocks as well as many other oscillating objects to synchronize with each other even in the absence of any external influence,” explains Marc Timme, theoretical physicist at the Max Planck Institute for Dynamics and Self-Organization in Göttingen. The professor heads a Research Group that studies the dynamics of networks and analyses, for example, the behavior of electricity grids. The self-organized synchronization of seemingly independent oscillators to one frequency can be observed in many systems in nature and engineering. The prerequisite is often a “hidden” coupling, as via the joint suspension for the pendulum clocks. Scientists like Timme also call this a locking behavior, with all oscillators involved synchronizing to precisely one frequency and then remaining trapped in it. This actually works with children’s swings suspended from a joint beam as well. If they are pushed off from different starting positions, they may synchronize to a single frequency at some stage. The examples are not limited only to mechanical oscillations. “Synchronization also happens for many different biological networks,” explains Timme “The phenomenon for instance occurs in the brain when nerve impulses synchronize.” This synchronization of brain waves in certain areas seems to be important for the working of our thinking organ. But it can also achieve too much. “Large-scale, extensive synchronization of brain waves in the brain is characteristic for epilepsy,” says Timme. All these self-organized ordering phenomena are based on the fundamentals of the classical – non-quantum world. However, a German-Italian research collaboration has now discovered synchronization emerging even for pure quantum systems. This collaboration was initiated by Marc Timme together with his former postdoc Dirk Witthaut, who in the meantime heads an independent research group at the Forschungszentrum Jülich. The conceptually new work has now been published in the renowned Nature Communications journal. In the publication, the scientists demonstrate for the first time that isolated systems comprising large numbers of quantum objects, such as the atoms of a Bose-Einstein condensate which is trapped in an optical lattice, for example, can synchronize in a very similar way to classical systems of physics. In a Bose-Einstein condensates, whose experimental realization was honored with the Nobel Prize in physics in 2001, several atoms behave like a single quantum object, individual atoms can nevertheless be trapped in an optical lattice. Such grids are constructed from the electromagnetic potential of crossed laser beams and resemble an egg box made of light, in which the atoms are spread out. The quantum particles can synchronize in the box without any external influence whatsoever, meaning they are likewise self-organized. “This is the main news of our article,” says Timme. These oscillating quantum systems can be imagined as manyHuygens’ pendulum clocks. These clocks were coupled with each other via a beam, from which they are all suspended. In consequence, their pendulums oscillate synchronously after some time. The quantum systems synchronize in just the same way by interacting with each other. This self-organized transition to a synchronized collective is in complete correspondence with classical physics. This finding throws new light onto the fascinating phenomenon of entanglement. Entangled systems have been routinely produced in many physics laboratories for decades. The new results are not just important for basic research. For some time now the quantum information research field has been working on using entanglement as a technical resource, be it in quantum computers of the future or in the error-proof transmission of information. The article now published by the German-Italian collaboration also makes concrete proposals as to how the self-organized synchronization of a quantum collective can be detected in the laboratory. It will therefore be fascinating to see in which form the phenomenon really shows up and how it inspires new lines of research. For Marc Timme, this paper is also evidence of how important the collaboration between different disciplines is in making such unusual discoveries. He himself is an expert on the dynamics of classical self-organizing systems and synchronization in particular. His research fields are known as “nonlinear dynamics” and “network dynamics”, the former of which has also become widely known as “chaos theory”. Dirk Witthaut in contrast comes from the area of quantum physics. Only the intense collaboration of the two schools of thought in physics led to the discovery that classical synchronization in the quantum world has something to do with quantum mechanical entanglement. “It is often very difficult to fund and carry out such interdisciplinary projects in particular, because they cannot be assigned to any of the traditional disciplines,” says Timme. The success in Göttingen was only possible because the Max Planck Society supported this interdisciplinary research in the long term and as pure research without a predefined goal. 1 Comment on "Quantum Systems Synchronize Through Self-Organization"
A guy with several of these clocks once told me the oscillations of the Earth’s core synchronized them. I suppose that is on a par with the time my husband told me that the dribbler pin fell out of the flamstam housing. At the dealership I was proud to have the answer when the Serviceman asked what was wrong. The look that crossed his face told me the truth.